Blog of Swine: A pig-shaped three course dinner! With recipes! A pig-shaped three course dinner! With recipes! Wye Jon Lee reports about the Nissin cup noodles with animal figures. There are dogs, pandas and foxes, but my favourites are of course the pigs! The soup doesn't contain any actual meat. Wye Jon Lee says the "heads" are pretty much tasteless, but the pig soup overall has an aromatic curry flavour. You can find these instant noodles in Japan and many other Asian countries. Cup noodles are easy to prepare - just bring water to boil, add the contents of the bag to the water, and let simmer or stand in the water until the noodles are soft. Bon appetit! 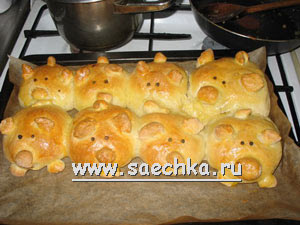 Saechka.ru features a recipe of Russian baked yeast dough pirogues in the shape of pigs, written by Anya (anette). The recipe is with meat filling, but you can substitute it with vegetarian alternatives. One personal favourite is a mix of potatoes, mushrooms, garlic and spinach. Saechka.ru is in Russian only, but russianrecipes.co.nz has an English-language recipe with the same type of dough. You just form the pirozhki into piggies instead, and give them "eyes" of black pepper. Chocolate Peppermint Polka Dot Pigs! 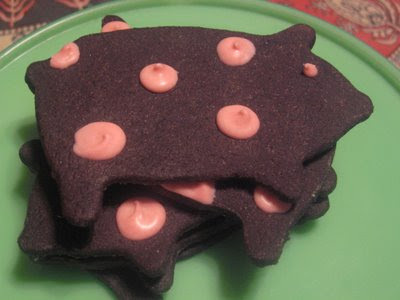 Sarah at Once Upon a Cookie shares her recipe of lovely polka dot piggy cookies, adapted from a recipe in The Good Cookie by Tish Boyle. The mix of dark cocoa dough and white chocolate dots probably tastes as yummy as it looks! The teats are in the wrong place. 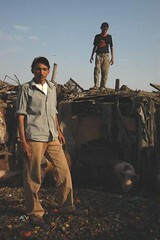 Current call for action: Rosi!